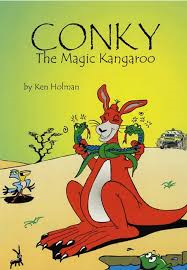 Conky the Magic Kangaroo is a very Australian story about a giant red kangaroo named Conky who has magical super powers and who can even talk with humans. Conky is a story of adventure, humour, courage and friendship. In truth, the story will never ever really end as long as there are children with hungry imaginations and native animals still living in the bush. There are two wonderful Conky tales in this book that can be enjoyed by adults and children alike and provide endless wonderful descriptions of the Australian outback in all its splendour and harshness. There is also a strong message regarding the conservation of the native animals. 'Conky the Magic Kangaroo' is the first in a magnificent series.